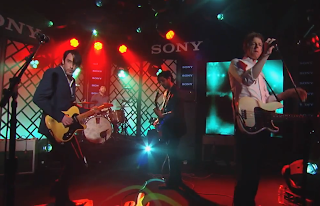 WJSG Internet Radio: Divine Fits on Jimmy Kimmel Live! Divine Fits on Jimmy Kimmel Live! Divine Fits’ Britt Daniel, Dan Boeckner, and Sam Brown are back on the road in support of last year’s A Thing Called Divine Fits. Last night, the all-star trio hit the stage at Jimmy Kimmel Live! and performed two songs: “Like Ice Cream” and a cover of Tom Petty’s “You Got Lucky”. Replay both performances below.